Hilton Head Island is a small community, so let’s get this straight right up front. If you see me out after 5 p.m., you can bet I’ll be sipping a glass of chardonnay. So this is not one of those fire and brimstone sermons about why you should stop drinking. However, it may be a wakeup call if you are struggling with your weight. While health authorities frequently tout the benefits of a single drink per night—benefits such as lower risk of heart attack, stroke and diabetes—how alcohol affects your shape (and your health) depends on a host of factors such as genetics, your diet, your gender, and your habits. So if you’re having one drink per night and you like what you see in the mirror, feel free to turn the page. If, on the other hand, you are having a few drinks a night and developing a paunch or muffin top, stay tuned. No matter what your opinion about the health effects of alcohol, it’s easy to agree that it is not a diet food; and because alcohol has no nutritional value, the calories consumed are frequently referred to as “empty” calories. Having a drink now and then won’t derail your efforts, but consuming alcohol on a regular basis can certainly make weight loss more challenging. That’s because the average serving of one ounce of 80-proof alcohol contains about 90 calories—before mixers. In addition to the calories in the drink, studies show that people tend to eat about 20 percent more when they drink with a meal, possibly because alcohol interferes with satiety or simply makes judgment fuzzy and temptations harder to resist. Many foods that accompany drinking (peanuts, pretzels, chips) are salty, which can make you thirsty, encouraging you to drink even more. 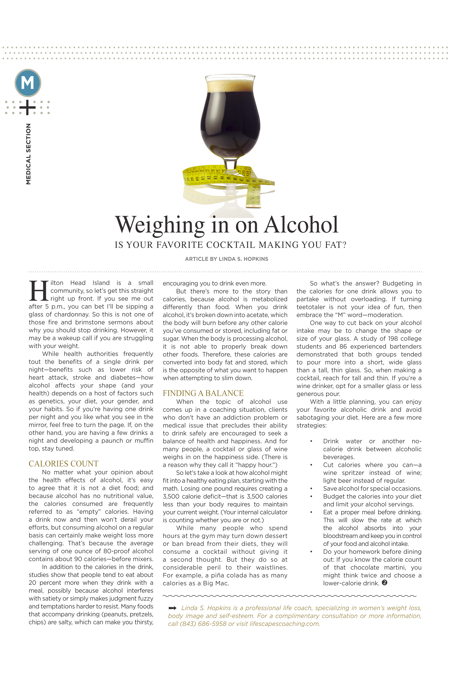 But there’s more to the story than calories, because alcohol is metabolized differently than food. When you drink alcohol, it’s broken down into acetate, which the body will burn before any other calorie you’ve consumed or stored, including fat or sugar. When the body is processing alcohol, it is not able to properly break down other foods. Therefore, these calories are converted into body fat and stored, which is the opposite of what you want to happen when attempting to slim down. While many people who spend hours at the gym may turn down dessert or ban bread from their diets, they will consume a cocktail without giving it a second thought. But they do so at considerable peril to their waistlines. For example, a piña colada has as many calories as a Big Mac. So what’s the answer? Budgeting in the calories for one drink allows you to partake without overloading. If turning teetotaler is not your idea of fun, then embrace the “M” word—moderation. One way to cut back on your alcohol intake may be to change the shape or size of your glass. A study of 198 college students and 86 experienced bartenders demonstrated that both groups tended to pour more into a short, wide glass than a tall, thin glass. So, when making a cocktail, reach for tall and thin. If you’re a wine drinker, opt for a smaller glass or less generous pour. -Drink water or another no-calorie drink between alcoholic beverages. -Cut calories where you can—a wine spritzer instead of wine; light beer instead of regular. -Save alcohol for special occasions. -Budget the calories into your diet and limit your alcohol servings. -Eat a proper meal before drinking. This will slow the rate at which the alcohol absorbs into your bloodstream and keep you in control of your food and alcohol intake. -Do your homework before dining out: If you know the calorie count of that chocolate martini, you might think twice and choose a lower-calorie drink. Linda S. Hopkins is a professional life coach, specializing in women’s weight loss, body image and self-esteem. For a complimentary consultation or more information, call (843) 686-5958 or visit lifescapescoaching.com.